In our school, bringing in a radio was an offence for which you could be hanged. It was even more serious than wearing platform shoes or the wrong colour shirt. Nevertheless, just as in totalitarian states, we ignored the law because radio meant so much. Admittedly, we only risked the wrath so we could hear the chart, rather than the latest news from the Empire. This was a period when Tuesday lunchtime was sacred. Paul Burnett would effortlessly run down the BRAND NEW chart. Anxious to hear who was up and who was down, we would assemble in frozen huddles, rather hoping the marauding teachers would pursue the smell of smoke from neighbouring miscreants rather than the sound of JAM jingles from our small crowd. Back then, blackberries, apples and oranges were confined to orchards; and radio was the only way to get the news. Having caught the update between Geography and double Maths on a Tuesday, we could then look forward to Sunday. It was actually the only exciting thing about a day on which all shops were closed; the lukewarm weekly bath was taken; and that back to school feeling would hit the pit of the stomach when the miserable theme tune to 'Sing Something Simple' rang out as you searched for your PE kit. 6.00 pipped, and mother busied herself ironing and prepared to watch 'Upstairs Downstairs'. Meanwhile, in our icy bedrooms, we would crank up the radio to enjoy the FULL Top 20. It was broadcast in stereo. Not that anyone had a stereo radio, but mono FM was certainly better than AM. Back then, Radio 1 was not on FM, but hijacked Radio 2’s frequencies on occasions at the weekend, presumably when the Light's delirious management had gone home for a sherry. Like Blue Peter presenters, you can tell someone’s age by the chart show presenter they loved the most. Some respected radio brethren go dewy-eyed at the words ‘Bruno Brookes’. Others wet themselves if anyone mentions Tom Browne. Sunday evening was self-evidently inspired scheduling for the chart. It had not always been thus. When Alan Dell first took a Biro to a copy of the music press in 1957 and ran down the numbers that matter most, it was scheduled late on a Sunday night. David Jacobs then started to assemble something more akin to our current chart, broadcast on Saturdays, before AlanFreeman barged in and appeared to prefer to work Sunday teatimes. From that moment, whatever its name or the programme in which it was housed, the ‘chart’ has been part of our Sunday evening ritual. The BBC possibly thought, with good cause, that the fragmented commercial radio network would never be able to assemble a nation-wide chart offering. Some stations had charts. Some did not. Trent in Nottingham was allergic to anything resembling chart shows in its early ‘credible’ era, before eventually installing one which peculiarly began with the Number One. Eventually, commercial radio’s trade body (then the Association of Independent Radio Contractors) played Kofi Annan and co-ordinated a 'Network Chart' chart offering across the commercial network of stations. Back then, networking was rare across any stations, let alone the whole country. In those pre-satellite days, the chart was originally despatched down the mono ‘IRN line’, so it sounded little better than ‘Dial a Disc’ (Ask your granny about dial a disc). David ’Kid’ Jensen was its first host, known as a ‘national name’ from his time at Radio Luxembourg and BBC Radio 1. Nescafe was to be its first major sponsor, although the coffee folk could not be mentioned in the programme title itself. The programme evolved, as the sponsor changed, to the Pepsi Network Chart, to the Pepsi Chart and then hit40Uk and now the Big Top 40. It worked though. 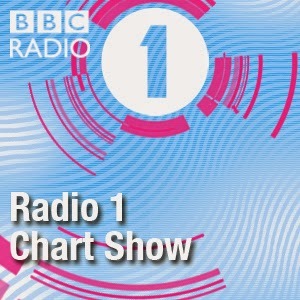 The commercial radio chart is now bigger than the BBC’s. Both are huge. 569,000 adults tune in as the BBC’s chart begins, with another 68,000 runny-nosed kids eavesdropping too. There are few mass-appeal destination shows now on British music radio. The days of gathering round to listen to ‘Music Whilst You Work’ are long gone. The chart show remains the single best known appointment to listen. It's ironic that maybe the only other is 'Pick of the Pops' on Radio 2, a retro version of the chart itself, bearing an original name. If the BBC do re-paint this national treasure, I wish them well. The great thing about BBC radio is that it can be first to try stuff out, without risking millions in revenue. Rightly, their decision will be unaffected by my fond ramblings above and more influenced by the tastes and interests of a complex and savvy new generation. It would be an unnecessary cheap gag to suggest that some of those listeners nowadays would find counting to 40 a challenge. Sunday night is a time when people are available to listen to radio, and that possibly means more than being ‘first’. In the short term, I imagine commercial radio would benefit from the displaced audiences. The new flavour of BBC chart would, however, find an important new place in a new generation's heart and would likely still be the one the TV shows come to when they want to do a piece about the Christmas Number One. Presenting a chart well must merit a mention some loud applause here. It demands huge delivery skill, precision and rhythm. Maybe not quite as much skill as in bygone years, when one had to find the records, time them, then add up all their durations, and those of the ads, on the back of an envelope. Every word counts. As I played back Simon Bates's first Top 40, aired in November 1978, I observed he boomed 'This week's British..." before playing the 'Britain's Number One' jingle. With a smile, I noted in the write up that he would have kicked himself for doing that. He tweeted to let me know he had. Let it go, Simon. Let it go. Whilst radio will remain powerful and special for a good few generations yet, I cannot help feeling that no 15 year old would ever bother breaking a rule for it nowadays. What I am sure of, however, is that this very Sunday, some teenager would have listened to Marvin Humes or Clara Amfo and thought "that's what i want to do when i grow up".